WESTBURY, Long Island (WABC) -- Three people are facing charges after an attempted kidnapping on Long Island. According to the Nassau County Police Department, on Sept. 4, Ayeisha S. Woods, 22, of St. Albans; Mark Persaud, 29; and Jeanette Ortiz, 33, of the Bronx, went to a home on Grand Street in Westbury and knocked on his back door. 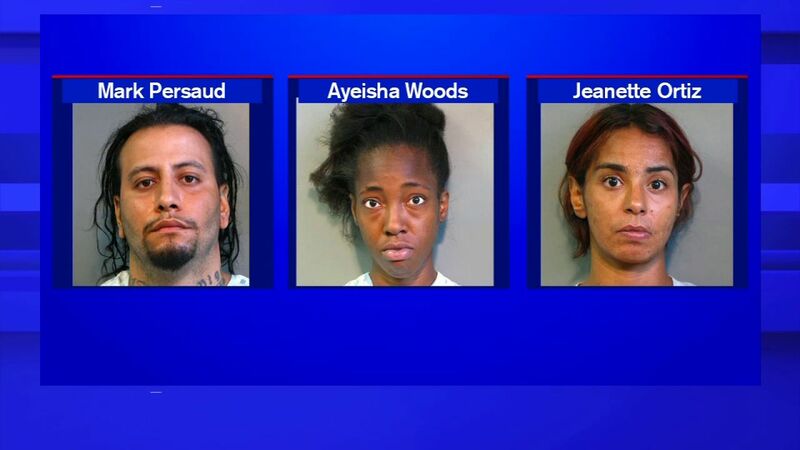 When the victim opened the door, the three forced their way into his home, police said. The victim grabbed a knife from the kitchen. Police said Woods and Pershaud struck the victim with a pistol and an axe handle; Woods took the keys to the victim's 2014 Ford Edge and exited the home. Police heard a radio transmission for a disturbance at the home and responded. When they arrived, Woods was in the car and had shifted it into reverse and sped toward them, forcing the officers to jump out of the way to avoid being struck. The detectives followed Woods to pull her over, but she lost control of the car and hit a parked vehicle on Roosevelt Court, police said. The victim was treated and released from a local hospital for injuries he sustained during the attack. Woods and Persaud face several charges, including kidnapping 1st degree (attempt). Ortiz is charged with burglary 1st degree. All three defendants are expected to be arraigned Tuesday in Hempstead.